We have all had the sensation that someone is watching us. Studies have confirmed that many internet giants is following our every online step, but it’s not just Google we need to worry about – with politicians frequently claiming that they are being spied on and WikiLeaks’s revelations concerning the CIA, how does the mass spying machine affect us? Inspired by former NSA employee Edward Snowden, who risked his freedom to expose, Proto-type Theatre brings us a daring exploration into the erosion of our privacy. A Machine They’re Secretly Building arrives at Northern Stage until Wednesday 26th April, setting out to unveil and prove our deepest suspicions. It explores the implications of CCTV cameras and other recording devices in the street, in our offices, in restaurants and theatres, and even in the places we least expect them like our homes, our smart TVs and mobile phones. In an intriguing selection of media, including classified intelligence documents, film and music, the audience will be treated to a history of citizen surveillance based on top-secret information from WWI intelligence to the events of 9/11, and the chilling possibilities of an unknown future. 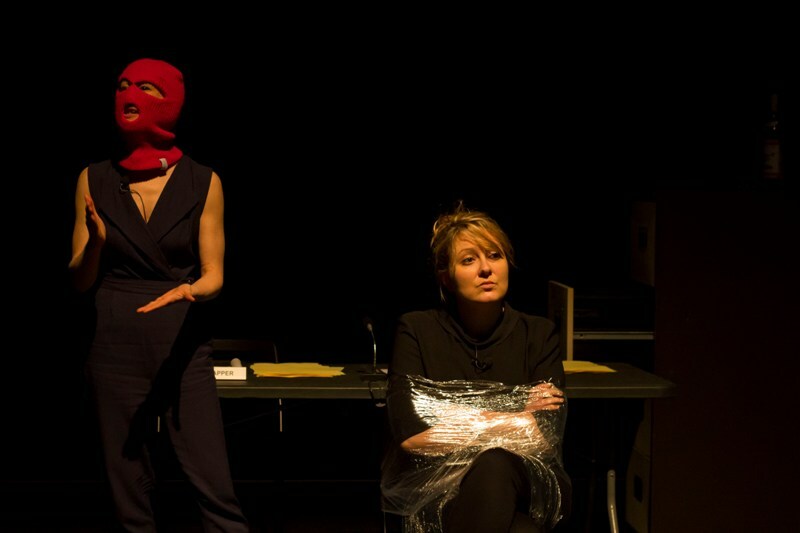 As symbolised by the balaclava-clad actresses, it raises not only the question of our own sense of privacy but also of how our governments are, in fact, shaping and controlling our identities.